Meanwhile, in a secret location outside London, a team of propagandists gather daily to transmit a fake news radio program into German-occupied Europe, spreading confusion and fooling the enemy into thinking that they are listening to a real German radio station. Leading this team is Sefton Delmer and by his side is Bonhoeffer’s friend Otto John, eventual head of West Germany’s domestic intelligence service and Ian Fleming, British naval intelligence officer and creator of the iconic James Bond spy novels. Did fearless German resistance plotters and shrewd Allied propagandists make a difference? And how does Dietrich Bonhoeffer bring into focus ethical challenges during his final days in the dying gasps of the Third Reich? 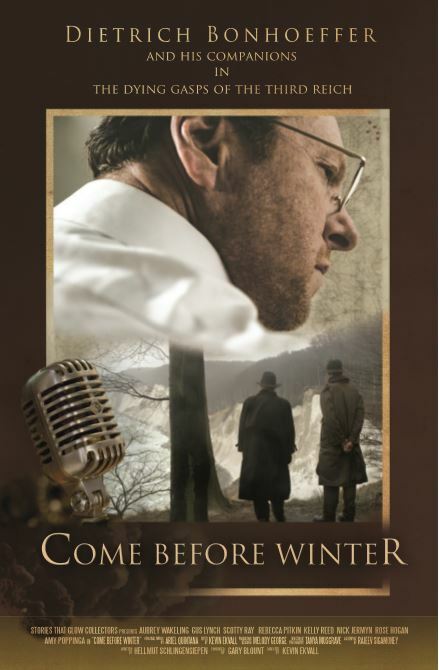 Come Before Winteris a passion project of Minnesota psychiatrist Gary Blount. Inspired by Bonhoeffer’s exemplary faith and courage, Blount began researching Bonhoeffer during his college years and has been fascinated with the story ever since. Over the last few decades Blount researched this beloved theologian, making several trips to Europe to visit Bonhoeffer’s family, interview scholars and experience the places where Bonhoeffer’s life unfolded. Gus Lynch was born in Buenos Aires, Argentina and was raised in New York City. His first language was Spanish. He currently resides in Los Angeles while pursuing his acting career. Aubrey Wakeling was born in St Albans, England. Classically trained, he has numerous film and TV credits to his name, including the lead in the Emmy winning Power of Art (BBC). He has lived in Los Angeles, California since 2010. Rebecca Summers was born in Hampshire, England. She studied theater at Queen Mary's College and screen acting at the International School of Screen Acting in London, UK. She has appeared in many feature films, award winning shorts and international commercials. She made her theatrical debut playing the lead role in the psychological thriller The Spell; followed by The Gridiron, Silent Retreat, The Lovaganza Convoy, Black Hearts and Advantageous. She is currently living in LA. Scotty Ray is an adjunct Professor in Drama at La Sierra University. Scotty holds an MFA in Acting from the American Repertory Theater/Moscow Art Theater School at Harvard University and a BA in Mass Communication with minors in drama and religion from Walla Walla University. Improv Training from The Groundlings Theater in Hollywood. L. Kelly Reed is a professor of English at La Sierra University in Riverside, CA. He has been teaching there since 2002 and has been acting on stages for even longer. Come Before Winter is his first feature film. Kelly also edits fiction for Red Adept Publishing.